If last night was an example, the Atlantic Yards documentary Battle of Brooklyn is sure to spark a lot of discussion. A screening of just a half-hour of the film-in-progress was held last night at New York University’s Cantor Center, and the audience—a mix of those interested in Atlantic Yards, eminent domain, and film—had a lot of questions for the panel set up afterwards. 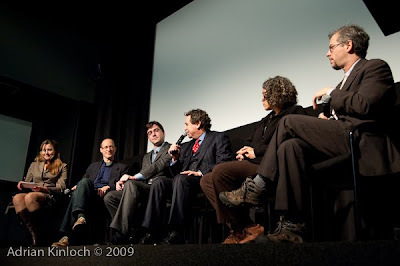 From left: Christina Walsh, IJ organizer; filmmaker Michael Galinsky; Bob McNamara, IJ attorney; Norman Siegel, attorney challenging eminent domain; psychiatrist Mindy Fullilove; and film protagonist Daniel Goldstein. (Photo by Adrian Kinloch, part of a set). There’s FCR spokesman Bruce Bender unctuously explaining the benefits of the project and declaring that, if all goes well, we’ll see an arena in a couple of years. And there’s Markowitz at the 2004 State of the Borough address wearing a Nets jersey and shooting a basket. And there are already hints of the class and race tensions evident in the story, with then-Assemblyman Roger Green at one point seeming to express concern about the project while declaring that a Community Benefits Agreement is the solution—and Darnell Canada, a founder of BUILD (Brooklyn United for Innovative Local Development) flatly declaring that he’ll support the project if it helps his community. City Council Member Letitia James gets some screen time expressing her implacable opposition to the project, but the leaders of the opposition are Goldstein and Patti Hagan (left; photo by Tracy Collins), the latter of the Prospect Heights Action Coalition, who—and perhaps we’ll see more about this in the film—was removed from the DDDB steering committee after internal tensions. 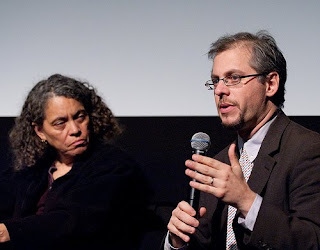 Hagan, explained filmmaker Galinsky (right, photo by Kinloch), was his entrée into the film; he’d seen posters she put up warning about the Atlantic Yards plan. He called her and said he’d start filming in half an hour; hence the scene of Hagan doggedly trudging through snowy sidewalks, laden with bags. Hagan lives near but not in the Atlantic Yards footprint; she suggested to Galinsky that one of the condo owners (as opposed to business owners or renters) seemed likely to resist Ratner’s buyout offer. “She said, ‘There’s this one guy, Dan Goldstein, I think you should meet him… he’s a fighter.’” And Galinsky and Goldstein were already friendly. 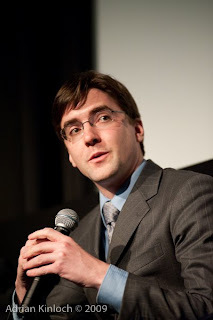 The Daniel Goldstein of 2004 is still something of a neophyte activist, clean-shaven (as opposed to goateed) and somewhat unsteady during a public speech at a rally. At one point, he says to the camera, “I think I like this.” So he clearly embraced the fight as a challenge. There’s so much more. For example, missing from the first third was Jim Stuckey, FCR’s initial point man on AY, but presumably he’ll emerge in the sections on public meetings in late 2004 and 2005. 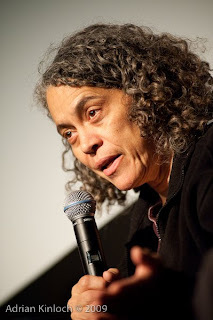 Moderator Christina Walsh of the Institute for Justice said, “All of us at IJ are really excited about this film…How masterfully it depicts the horror and outrage of eminent domain abuse.” She noted that, unlike all but a handful of states, New York had yet to reform eminent domain laws. That’s true if you count supporters and donors, but the AY opposition wouldn’t be the same without a full-time activist with press, graphic design, and webmastering skills—and who could serve as an eminent domain plaintiff. 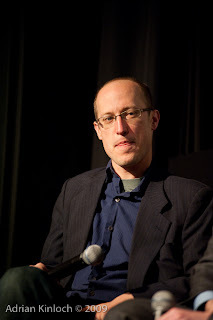 Galinsky said the frame of the film was a matter of storytelling, to balance a personal story and the breadth of the conflict. Columbia psychiatrist Fullilove, author of Root Shock: How Tearing Up City Neighborhoods Hurts America, and What We Can Do About It, talked about the damage eminent domain has done to communities she’s studied, such as the Hill District of Pittsburgh, and stressed the importance of strong communities to peoples’ lives and health. He said that too often it’s the case of “politically powerful developers and political appointees, teaming up… promising to build castles in the sky,” and cited the aftermath of the Supreme Court’s 2005 5-4 Kelo vs. New London case, where eminent domain was upheld but nothing was built. Walsh asked Goldstein why he fought. Goldstein cited a few turning points, and made a curious slip. “That was February '04, I was determined that I was going to see this fight forward. I felt that if I wasn’t going to fight this fight that fell into my lap,” he said, there was no other fight he could wage. He said it was a little strange to be talking about it, because the fight is ongoing and, while everyone in his building is gone, others in the footprint are still fighting. Walsh pointed to footage of Goldstein and Siegel testifying before a City Council hearing; all morning Forest City Ratner had the microphone and, after recess for lunch, only three Council Members were left. Goldstein (right, with Fullilove in photo by Tracy Collins) said there have been “a few standout politicians,” citing James and state Senator Velmanette Montgomery, but said he didn’t have much faith in government. “I think I had a lot more faith before we started,” Galinsky observed. Walsh asked Siegel to discuss the Columbia case. He said that, as far as he knows, New York is the only state where challenges to eminent domain begin not in the trial court, where testimony under oath and cross-examination is possible, but in the appellate court, where only the written record is considered. “In the mid-70s, our state legislature changed that process [to the current one], because they thought it was delaying development,” he said. That statement might have prompted a whiff of regret from some in the Atlantic Yards fight concerning their decision to part ways with Siegel and hire a different law firm to pursue the eminent domain litigation. It also pointed to one of several factual differences between the Columbia and Atlantic Yards cases (though the fundamental question of arbitrary application of blight standards remains the same). Because Columbia’s expansion threatens displacement of low-income residents, a significant group of local activists back the lawsuits, which are brought by a couple of local businesses and funded by one, Nick Sprayregen of Tuck-It-Away. The Atlantic Yards fight is more complex; the state environmental review both points to displacement as well as new affordable housing and, while much of the affordable housing would be delayed and unaffordable to members of the advocacy group behind it, ACORN, the latter group is contractually committed to supporting AY, and delivers. "We still have a huge challenge in the Court of Appeals… and Supreme Court, to give them a chance to undo what they did," Siegel said. Walsh asked McNamara what reforms New York needs. "New York’s system of eminent domain is deliberately designed to make it impossible" to fight back, McNamara said. "In New York, when the government decides it might possibly someday take your land, it’s your job to sue them, and within 30 days of making that announcement," he said, noting that, until IJ got involved in a case known as Brody, the state didn't have to tell people directly but instead just publish a small legal notice. "It ultimately boils down to this," he said. "The ESDC shouldn't be allowed to take away Daniel’s home because someone says his neighborhood is blighted. No one has to swear, no one has to testify under oath. No one has to answer a single one of his questions about why the neighborhood is blighted. The system is broken procedurally.It’s also broken substantively, in terms of [the definition of blight]." He cited the use of a single piece of graffiti, the presence of weeds, and the concept of underutilization. "The proper word for what these properties are is not blighted. The proper word is coveted." "It’s the legislature's job," he said, to reform the system. "And it is the court's job to step up into the void and do what judges are supposed to… to take a serious look at what’s going on in the overall context and actually exercise independent judgment." While he said that "talking about eminent domain in New York seems like a downer," David actually won the fight against Goliath. One audience member suggested that it was interesting to see the libertarian IJ sitting next to Siegel, noted leader of the New York Civil Liberties Union. "I’m very comfortable agreeing with Norm Siegel," the IJ's McNamara declared. Goldstein described a visit earlier in the day from conservative columnist George Will, an opponent of eminent domain, who's presumably writing about the eminent domain cases in New York. "I think… it’s nice to be unified, across the political spectrum, on an issue… I have enjoyed talking with everyone, from left to right, because I think the people agree on this issue, and it’s unusual." Siegel was more blunt. "Let me cause some controversy," he said. "Liberals, generally, are not good on eminent domain. Liberals see government as an affirmative force to improve mankind. Liberals… do not respect property rights as they respect economic rights and social rights." "Conservatives, as stereotypical statement, are distrustful of government, wind up being generally good on this issue, especially if they’re libertarian conservatives," he said. "It’s not unusual to see strange bedfellows, if you realize the common ground is distrust of government power." 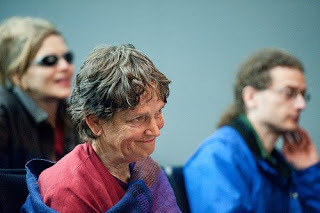 Fullilove (right, photo by Kinloch) said "it’s one of those things that lead to surprising moments," noting that she'd been at a property rights conference with Hagan and her sister Schellie Hagan. "There were some moments when it was a little scary… am I going to be lynched?" But she said "it’s good to have coalitions with surprising people… that we have common ground." One audience member, who declared he was "a good libertarian," questioned why Goldstein didn't take a buyout when "everyone in your building sold out except you… it’s obvious they offered well above market value… I think it’s a weak point in your argument." Goldstein, who didn't specify that he was in fact offered a significant financial gain, said the deal wasn't fair because it was "made under threat of eminent domain." Meanwhile, he said, "The last offer I was made is from the state of New York… it’s extremely lowball, forget just compensation, it’s not fair market. It’s well below what I paid for it." And, as Siegel said in the film, Goldstein said, "it’s not about money." His neighbors were opposed to the project but couldn't deal with the fight: "I don’t blame them one bit." Siegel said it's "not a fair question," saying that Goldstein, the plaintiffs in the Columbia case, and some businesses in Willets Point facing eminent domain have difficult struggles to stand up and fight. "We shouldn’t in any way question their motives," he said. 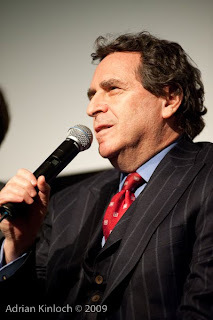 Goldstein added that "those buyouts came with a contract that gave up their free speech rights." Moreover, Ratner's generous offer, it turns out, came from $100 million in taxpayer money. "Now, when they compensate us, they lowball it, because it would be Ratner’s money," he said.